For the BMW sport bikes S 1000 RR and HP4 2D Debus & Diebold Meßsysteme offers professional measurement extensions for getting more out of your bike. To be able to use the extensions an HP race data logger is necessary. The logger and the accompanying software can be ordered through your local BMW bike dealer. 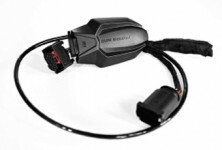 HP Race Datalogger on the BMW Motorrad Website. A full license of our Race software, like it is used in professional racing sport, offers more advanced analysis possibilities. Please contact us for more information. To get to the product offers fitting your needs, please select the type of the bike using the menu on the left side.